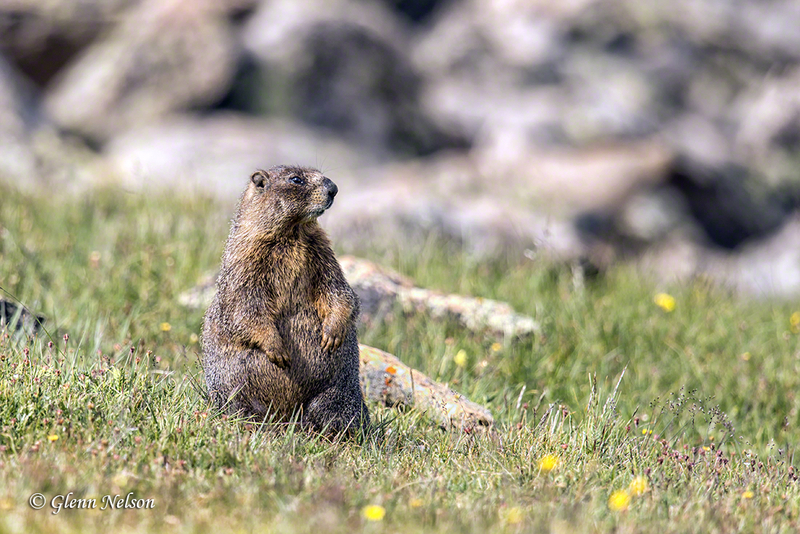 A Yellow-Bellied Marmot chills along Trail Ridge Road in Rocky Mountain National Park. When Florangela and I recently booked a trip to Denver, I immediately knew two things — that we would see our friends Gigi and Thad and, given the direction my photography has taken, that we had to visit Rocky Mountain National Park. I also knew one other thing: because of my issues with height, I had to strategize about dealing with the Rocky Mountain highs. During my pre-trip Googling, I came across Yellow Wood Guiding. 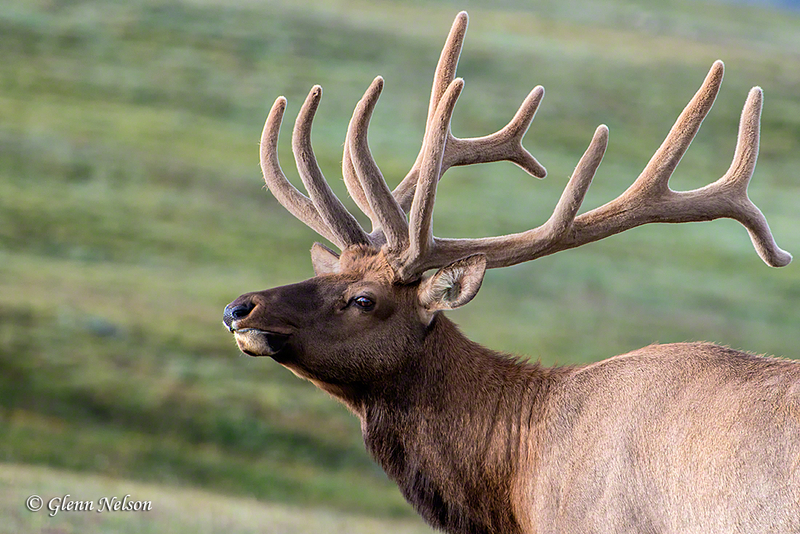 Its proprietor, Jared Gricoskie, is an accomplished guide and photographer who could customize “photo safaris” in RMNP. How perfect is that? (NOTE: Clicking on photos opens a larger version in a new browser window). During the booking process, Jared asks what you’d like to accomplish, then proposes a tour. I had a long laundry list: I wanted to photograph a sunrise and some other landscapes, I wanted to see Rocky Mountain Sheep, Florangela wanted to see a Moose, and I wanted him to take us where I knew we could not drive — the harrowing but exhilarating Trail Ridge Road. If you could detect a chuckle from an email, Jared’s response would be the one. He said we could find a sunrise, but Rocky Mountain Sheep would be tough, and it would require an entire six-hour search to find a Moose. If we did the sunrise, we probably would have to forego the others. I accepted the terms, but secretly hoped for Bighorn Sheep. 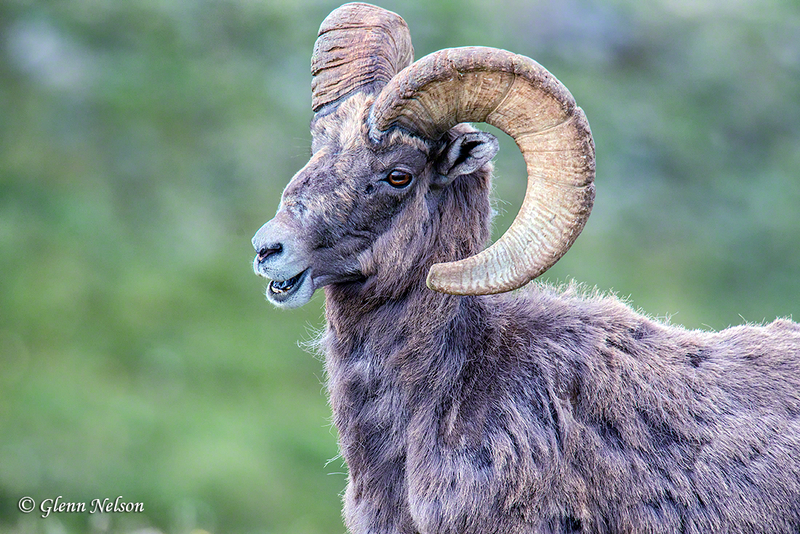 Some of my most vivid childhood memories are of my awe in seeing the Bighorn and Mountain Goats during our family vacations to Banff and Jasper, up in Canada. We lucked out with the sunrise (more on the landscapes in a future post) because it was a rare cloudy day. But our luck continued. While our hearts climbed up our throats on Trail Ridge Road, the creatures began to appear. First, Elk. Elk along Trail Ridge Road in Rocky Mountain National Park. 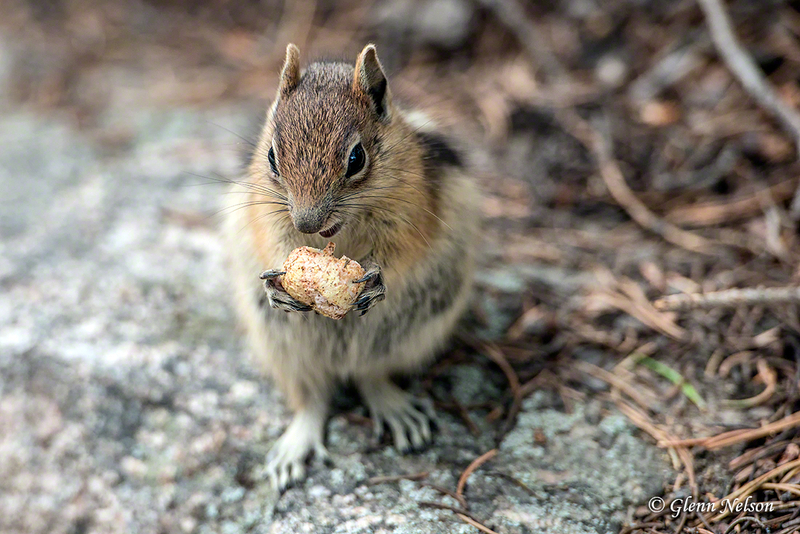 A Least Chipmunk along Trail Ridge Road in Rocky Mountain National Park. Then … we saw a car pulled off along the side of the road. 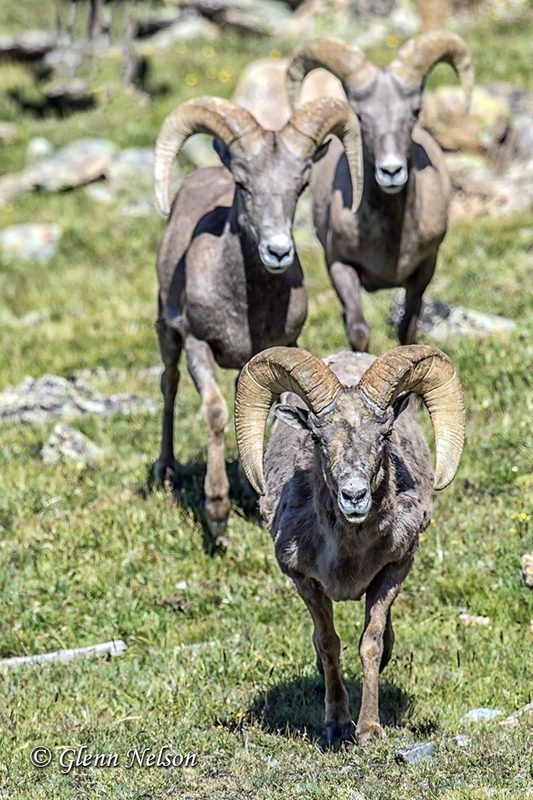 And … there they were — the Rocky Mountain Sheep, a herd of rams, no less. They were lounging and eating in the grass, laying in their food, so to speak. The alpha male was in the middle of shedding his coat, so he was kind of raggedy. 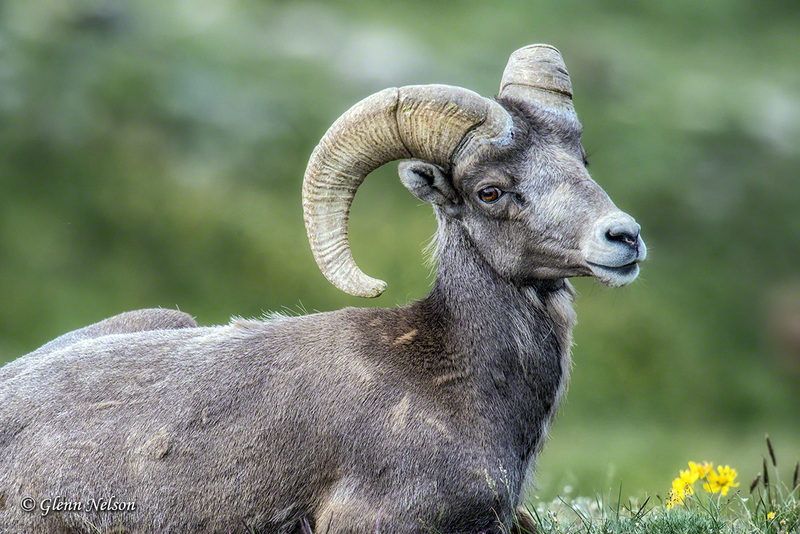 A male Big Horn Sheep, along Trail Ridge Road in Rocky Mountain National Park. So my best shots were of his young apprentice who, while a little scrawnier, had a nice coat, great personality and spent time among the wildflowers. A young Bighorn Sheep seems to be stopping to smell the wildflowers. 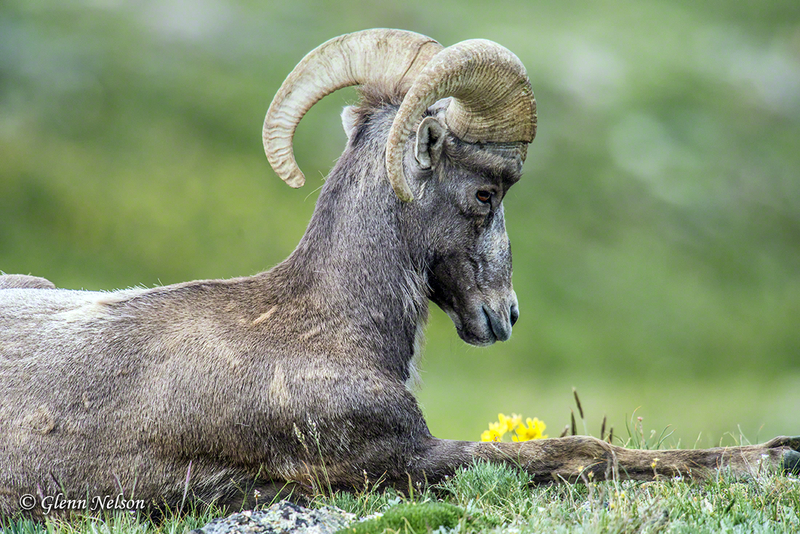 A young Bighorn ram next to wildflowers along Trail Ridge Road. The young ram along Trail Ridge Road in Rocky Mountain National Park. Next, we found an area just teeming with Yellow-Bellied Marmots and Pika, and spent quite a few being entertained by their antics. Shooting wildlife is much like shooting my more frequent subjects, the birds. All animals develop patterns; if you stop and observe long enough, you can determine them. It makes you wonder about us humans, doesn’t it? The Marmots were about territory. Well, not the youngsters, who pretty much did as they pleased. 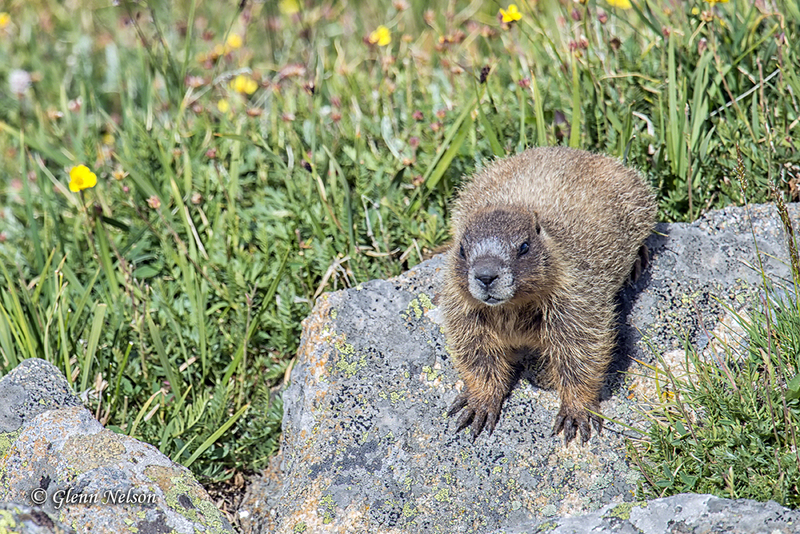 A young Yellow-Bellied Marmot along Trail Ridge Road. The adults either chilled or the males laid down the law in their territories, sometimes facing off to impress the females. Pretty universal behavior, right? 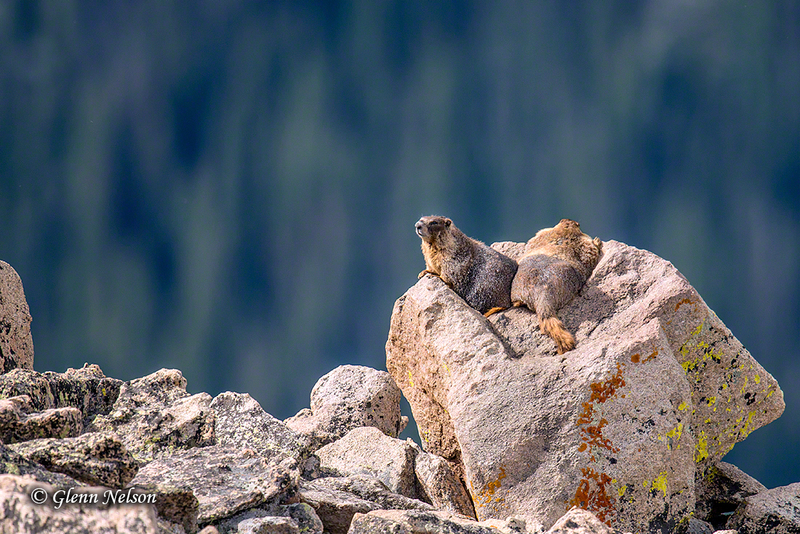 Yellow-Bellied Marmots sun on a boulder with a grand view. This one is facing off with another, larger male. If it looks like he’d kind of hiding, he kind of is. He later was chased off. 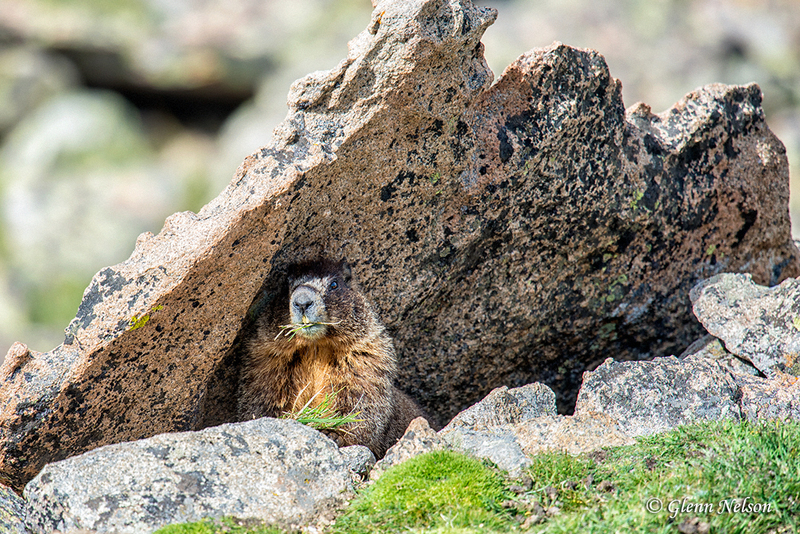 A male Marmot is keeping an eye on his competition from relative safety. The shot that got away: A Golden Eagle swooped down on the Marmots, in an effort to freak them out and flush them out into the open. I had my eye glued to my viewfinder, so I didn’t see it right away. I also was low to the ground, on a tripod, so I couldn’t adjust up fast enough to get anything but the raptor flying away. 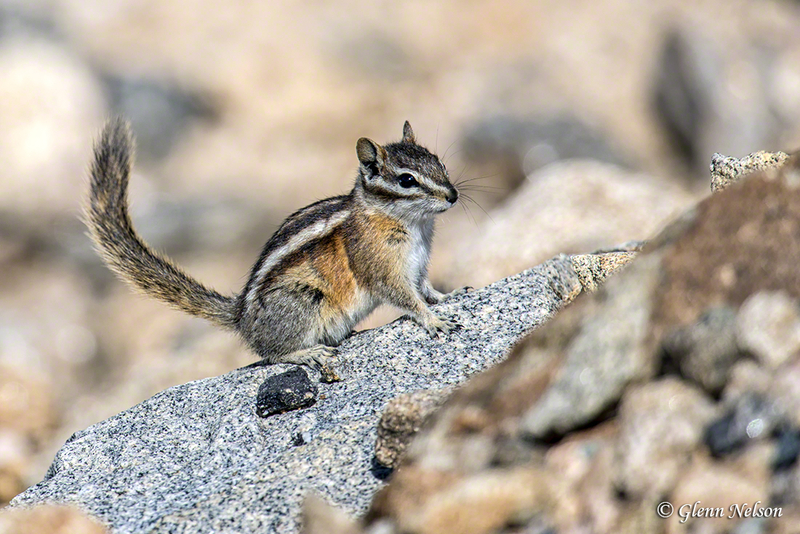 A chance to hear the squeaky barks and high-speed behavior of the little Pika got me over my disappointment. Those almost mouse-like, they actually are closely related to rabbits. If you look closely, you’ll see some of the resemblance. Pikas are very programmed. First, they go into sentry mode, checking for predators. Then they race around what can best be described as a “track,” along which they collect greens for the winter, then store them in their den. 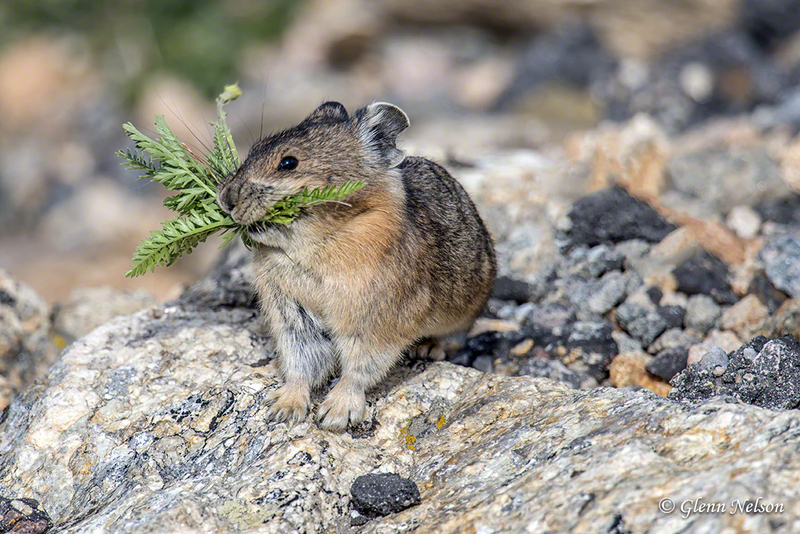 This Pika looks like it caught the bouquet at a wedding. 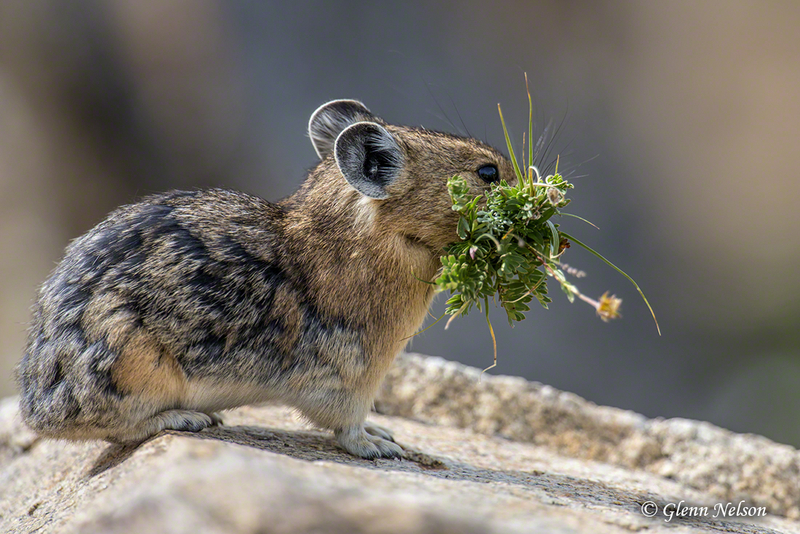 Its mouth full of winter nourishment, a Pika stops for a split second before continuing its journey at break-neck speed. 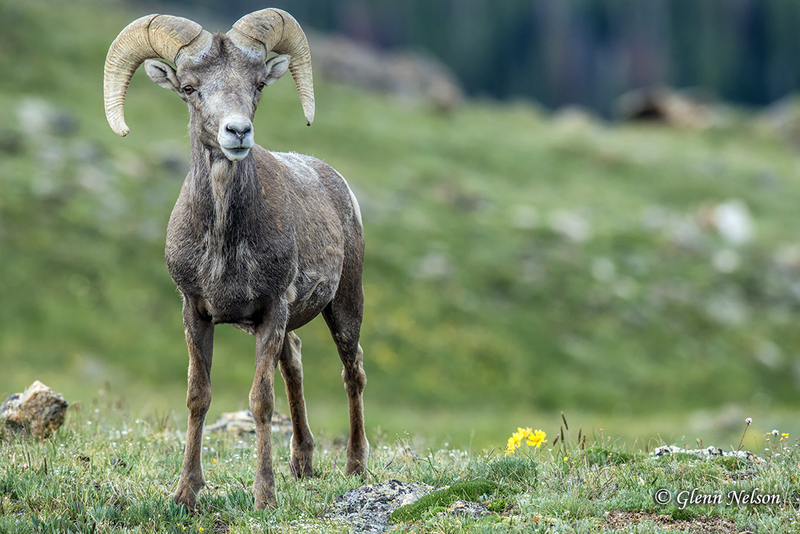 In the middle of all this, the Rocky Mountain Sheep filed into an area, just right of us, to lick the mineral-rich mud, which helps the development of their impressive horns. 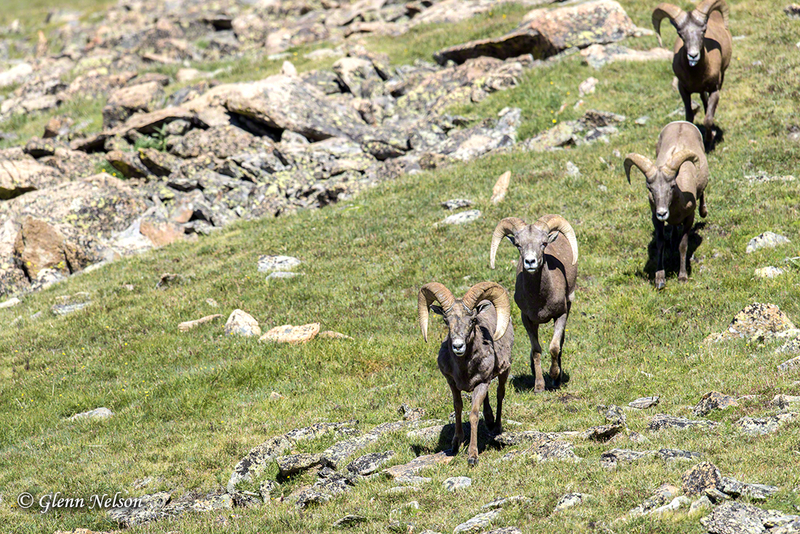 Bighorn Sheep file into an area for mineral-rich mud. The first Bighorn to arrive near the mineral-reach mud lick. I got photos of the Bighorns licking mud but, frankly, they aren’t very interesting. We mainly were waiting for a couple to lock horns and engage in a mini-challenge. I saw one. This photo to the right is mostly to show Jared, if he ever reads this, that I will indeed use vertical crops (though once in a blue, blue moon). I was just ecstatic that we got to see the Bighorn again. Florangela, by the way, had walked off to another vista and missed the whole thing. This is for her, too. What she didn’t have to miss, however, was Moose. While hiking to Alberta Falls later that day on our own, we spied this cow and her calf, which is out of sight. While we were checking her out from a safe distance, one idiot started knocking around in the brush to get a closer look. Not only is that against federal park regulations, it’s downright stupid because that cow is going to protect her calf from any perceived danger. And more people are hurt or killed by Moose than by about any other animal. Anyway, Bighorn Sheep, Elk and Moose comprised the Holy Trinity of Rocky Mountain game for us, so we were surprised, but ecstatic to complete it. I told Florangela that the next thing we’ll see is a Black Bear chasing a Mountain Lion. But no such luck. 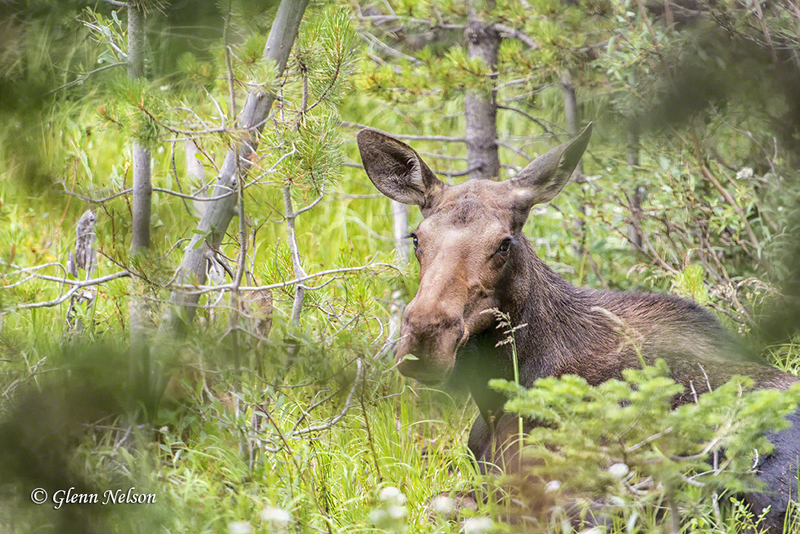 Mama Moose along the trail to Alberta Falls in Rocky Mountain National Park. That wasn’t a great shot — just a see-what-I-saw snap. 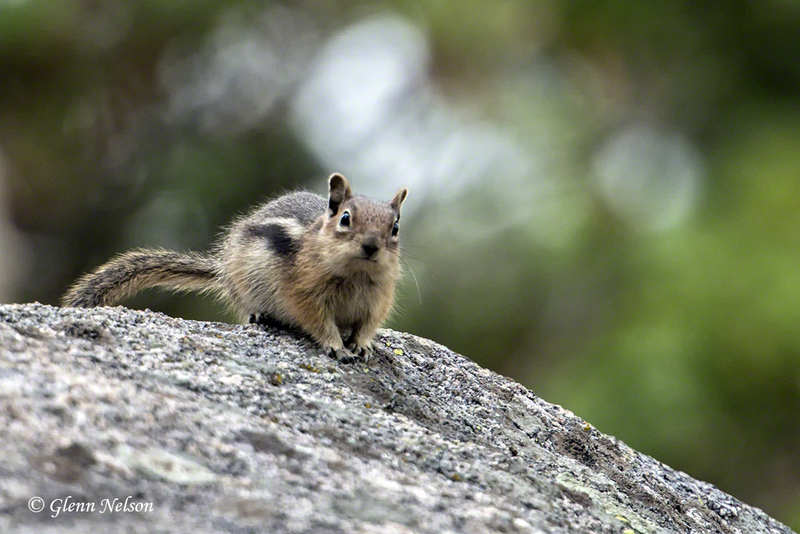 We got a better look on the same hike at the curious and cute Golden Mantled Ground Squirrels. They’re pretty fearless, though it’s illegal to feed them, or any other animals, in a national park, so they don’t beg (as much) like their state- and city-park brethren. The Golden Mantled Squirrels look a lot like the Least Chipmunks in the park, but they are larger and their stripes end at their shoulders. A Golden Mantled Squirrel checks us out from a safe place. This Golden Mantled Squirrel brought its own food to the party; it’s illegal to feed them. This is a longer-than-usual post for me, but I wanted to make the point that we saw all this, plus an assortment of birds, in one day at Rocky Mountain National Park. (P.S. : Jared’s guiding service is highly, highly recommended. Read my review on TripAdvisor here: Yellow Wood Guiding Review.